When I was a kid we often took car camping trips. I forget how many times we drove from Minnesota out to the west coast, but it was at least twice. There were two sites that I had always wanted to visit. First was Devils tower, as I had seen close encounters of the third time over and over. The second was craters of the moon. We never did visit these places. It’s a McCaa family tradition to not get what you want. 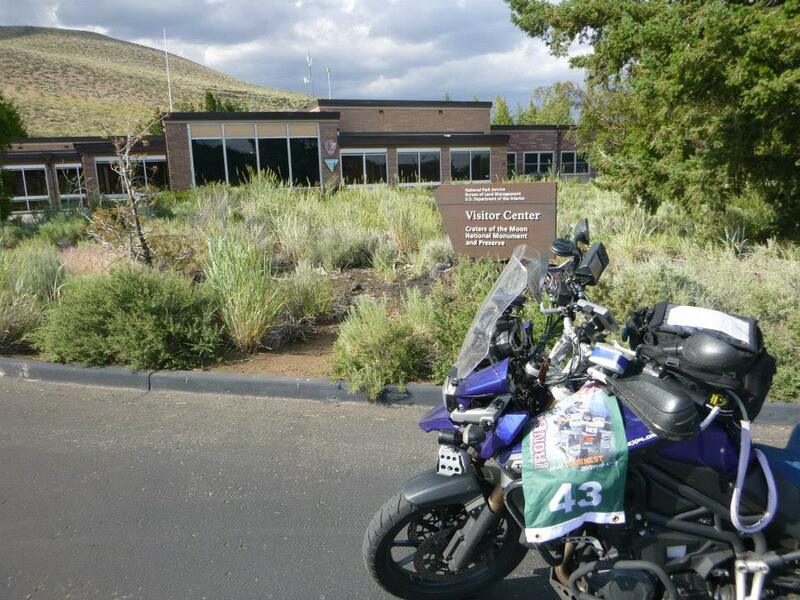 My next stop was Craters of the Moon. There was only one road construction site on my way and I managed to get there just as the last car was entering the zone. The flag woman waved me in. I ate dust for 5 minutes, but at least there was no standing around at the side of the road. Soon I marveled at the lava flows that is craters of the moon. It was a fast stop again and I was on the move. Well, now I’ve been there, but can’t say as I’ve really seen the place. Moving north I encountered some free range construction sites with no workers and no pilot cars, but lots of gravel. Gravel on a motorcycle is best at a little speed. The wheels act like gyroscopes and help with stability. Following an RV at 10 miles an hour is not an option. There’s probably some restriction on passing in a construction zone, but there was no sign to confirm that so I was soon watching the RV dwindle in my mirrors. As I got closer to Idaho falls I managed to get a decent cell signal. I did a little research and discovered that it’s only possible to predict the next eruption of old faithful and only to about +-17 minutes. However based on the previous day’s pattern I’d likely make an 11ish eruption. To make my rest bonus work that would require staying in the park, as I’d have to start my rest before midnight. I made some calls and ruled that out. It was a better idea to stay outside the park and get there in the AM for an eruption. I was also pretty sure a night photo would be damn hard. I doubted it was lit at night. The west entrance to Yellowstone has a bunch of hotels, but they were prohibitively expensive. It was only 7:20 PM, but I was faced with either stopping now or skipping old faithful. Of course, I figured all this out just north of Rexburg. Which according to my GPS was the last place with hotels before the west entrance. I hate turning around and I’m stubborn. I figured I’d give it 10 minutes in hopes of finding some place to stay where I wouldn’t have to backtrack. Luck was with me as I spied a billboard for the Guest House Inn in St Anthony, just a few miles ahead. It advertised its rate at $100 a night. While that’s about double what I like to pay, I figured that it must be an ok price for the area as otherwise why advertise it! Soon I was chatting with the receptionist and getting the key to my $100 room. Yes, it was before 7 PM but I was 5 hours ahead of schedule and I was adding big points to my route, I was not worried. It was before 7 and I was off the clock. I had figured out that I could actually stay longer than 8 hours as sunrise was about 4:30 in the park and it was about 100 miles away. I didn’t have to leave until 2:30am. Based on today’s eruption the first eruption after daylight would be at about 5:30. It was way too early to hit the sack so, first dinner and then maybe look a little at my route for tomorrow. But first, Laundry! I carry those little laundry soap pods, they are small, so they don’t take up much space in the bag. I took a quick shower and rounded up all the rather toxic smelling clothes from the previous days and hit the laundry room. Making good use of my time I then mounted up on the Triumph and went to the nearest gas station. I didn’t fully fuel so that I would have room in the tank for an early morning gas receipt. It was a good receipt, but I went inside and got one from the cashier as well. It too was perfect. I tried to use the ATM too, but it was not connecting, so I’d have only one safety in the morning. Chatting with the attendant she was ready to get off work and go celebrate her son’s 2nd birthday. I congratulated her on the momentous day and inquired about local restaurants. She extolled the virtues of Big Jay’s Burgers & Pizza which specialized in something called a pizza bomb. It sounded like a pizza that had been rolled up into a burrito like package. While I was dubious I took her suggestion. I stopped back at the hotel and moved the laundry to the dryer. On the way to restaurant, I decided that perhaps a pizza bomb might have a delayed fuse and possible secondary explosions later. On my arrival, I ordered a pizza but discovered that they had fresh strawberry shakes. As I had not had my daily ice cream I ordered one. The pizza was entirely forgettable, but the shake was fantastic! Before the rally, I’d seen Jon and Ande showing what they had packed for food. They had a perfectly balanced daily meal pack that featured some kind of dried buffalo stick. It looked kind of like something that a buffalo would excrete, It had nothing on my fresh strawberry shake! Back at the hotel I gathered my laundry and packed everything up for an early departure. I looked over the route but decided that there really wasn’t any modifications worth making. Maybe there should be some changes at the end of the day, but the early part of the day would just feature my detour to Old Faithful. By 9:00 PM I was in bed and astonishingly I was asleep in a few minutes. -Note: Times have been updated from an earlier version. Seems I was a timezone off.